It is difficult in the world we live in to help our children develop a positive self-image. Sadly, everyday they will be met with an onslaught of negative or deceptive messages about what makes a person beautiful, valuable, and loveable. And even more sadly, a lot of us have bought into these lies ourselves. If you have, you have the opportunity to let the negative body image mentality end with you. You can choose not to pass it on to the next generation by working through your own issues and actively teaching your children the truth about their bodies and their value as a human being. It is one of the greatest gifts you can offer your child and it is critical for them to understand the truth about where true beauty and value come from in order for them to reach their highest potential. 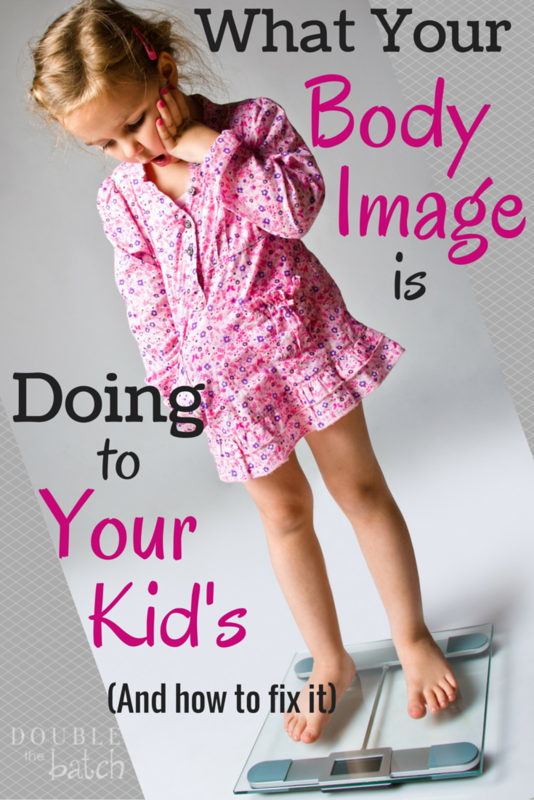 So, to help you do this, I want to share with you 5 rules for helping your child develop a healthy body image that I believe can make a huge difference in the way your child sees themselves. Rule #1– Do Not Express Your Own Dissatisfaction With Your Body or Anyone Else’s Body in Front of Your Child. I think this is one of the greatest gifts my mother gave me. I have no memory of her ever doing this. This includes any disparaging remarks you might make about how a certain piece of clothing makes your body look or someone else’s body look or talking about the diet you are currently on. It also means you don’t let magazines into your home that would encourage you to feel dissatisfied with your body. When you encounter them in the supermarket you, talk to your child about the lies they are teaching people about their bodies. Teach them about the objectification of women as they become old enough to understand it. Teach them about air brushing and photo editing and the unrealistic level of perfection they can create. Ask them if they think such deceptive things are worthy of their time and attention, and teach them how to move on. It is important to understand that every time you make a negative comment about your appearance, you are sending the message to your children that a person’s value is tied to their appearance. Your children view themselves as an extension of you. Therefore, anything negative you say about yourself they will internalize as a negative they also possess. And since they inherited your gene pool, there is a good chance the things you don’t like about your body may manifest themselves in their body at some point. If they have listened to you express dissatisfaction with yourself, they may also assume you are dissatisfied with them. I can’t imagine a parent truly wanting their child to feel that way. So, if you struggle with thinking negatively about yourself, do not give life to those thoughts by verbalizing them, and hopefully over time, you can stop thinking that way all together. As to the importance of not letting your children hear you criticize other’s bodies, my 8-year-old niece, who is a normal, healthy weight, had a classmate make a comment about her not being skinny in the lunch line. People-– children are not born hyper-critical of their bodies or the bodies of others. It is an attitude and perception they learn from an adult. So, for the love of all things- DO NOT TEACH YOUR CHILD THIS ATTITUDE!! I wanted to scream when my sister told me this story. The last thing we need on this earth is 8-year-old’s worrying about their weight! And you make our job in trying to help our children have a positive body image 10 times harder when we have to deal with peers making negative comments to them about their weight. How about we all do each other a favor and teach our children never to comment on someone’s weight or appearance unless it is to give them a compliment. Deal? Deal. RULE # 2– Do Not Make Negative Comments About Your Child’s Weight or Appearance. I can imagine few things more painful than having your own mother or father tell you you are fat or ugly. And though, I think the majority of parents would never dream of saying those words to their children, even what we may feel are well-thought out, gentle remarks about our child’s weight or appearance will most likely ring in our child’s ears the message– you are fat or you are ugly. So, just. don’t. say them. Even if you feel your child is overweight and needs intervention, bite your tongue. Your comments will more than likely exacerbate the problem. Your child may turn to unhealthy habits to cope with the fact that they don’t feel loved and accepted by their parent, which will probably lead to more weight gain, or worse– eating disorders and self-loathing. They may try to lose weight to please you, but do you truly want your child to lose weight out of fear they will lose your love and acceptance if they don’t? Of course not. We want our children to feel loved, and accepted, and safe in our homes. It is THE MOST important thing we can do for our children and the best defense against the outside influences that will try to lure them into destructive behaviors. Focus on that instead of their weight. Rule #3– Talk About Food in Terms of Health- Not Weight. Food should be neither our best friend nor our worst enemy, but, for some reason, when the idea that food is the thing that makes you fat gets drilled into our heads, this is the relationship with food that we develop. And most often this relationship manifests itself in eating disorders. So, avoid talking about food in terms of how it affects our weight. Most kids become overweight for two reasons- they are eating too much high calorie food and not getting enough exercise, or they have genetic disorders or health problems that cause them to gain weight or make it difficult to lose weight. If your child’s problem is what they are eating, well, you are the one that stocks the shelves, so take some control over that. And you can take away the screens that make them sit and and send them out the door to exercise without telling them it is because they are gaining weight. If your child’s problem is genetically or health related, you would never want them to feel bad about something they have no control over. This is why I say you should never make a comment about their weight. Instead, focus your conversations about food on the health benefits and detriments of different foods. This is important and valuable information that they need to understand, and it in no way connects their value as a human being to what they eat or how they look. Teach them how to make healthy choices and help them recognize when their body is feeling good or bad because of something they ate or how much of something they ate. Do not tell your child “if you eat that it will make you fat.” Instead, say things like “if you eat too much of that it will give you a stomach ache” or “that candy can rot your teeth and make them hurt if you eat it too often,” or “drinking soda all the time can lead to diseases that are pretty miserable later in life” or “eating lots of sugar makes it hard for your body to fight off sickness.” Make sure that they understand you are monitoring what they are eating, not because you don’t want fat kids, but because you want them to feel healthy and strong. It is the same with promoting exercise. Don’t say “you need to exercise so you won’t get fat.” Instead, say “exercise is fun and it makes you feel good and strong.” And then make it fun. Don’t give your kid some strict exercise schedule that you force them to follow. Kids naturally exercise when they play outside so just send those delightful little people out the door. Get them involved in some kind of sport they enjoy. Or just find some kind of physical activity they like and do it with them. Kids will rarely turn down one-on-one opportunities with a parent. And don’t just say these things– mean these things. Kids come in all kinds of sizes and shapes and as long as they are healthy, we should celebrate what ever size and shape they are. Rule #4– Warn Your Children in Advance About the Lies They Will be Told About Their Bodies. There is a pretty good chance that despite your best efforts to help your child have a positive body image, somebody at some point is going to make a negative comment to to them about their weight or appearance. Tell your child that it will happen. Help them understand that the people who generally make these comments are usually people who don’t feel good about themselves and so they make fun of other people in an attempt to make themselves feel like they are better than others. Their words are a reflection of their insecurities and not your child’s appearance. Teach them that instead of feeling sad about a mean thing someone says to them, they can feel sympathy for someone who is hurting enough inside to want to hurt someone else, and teach them to disregard anything they say. If there are people in your friends or family circle that have a preoccupation with weight and appearance, protect your child from their comments by having a polite, but frank discussion with them about what is and what is not appropriate for them to say to your child in regards to their weight or appearance. It isn’t healthy for them to transfer their own insecurities about weight and appearance onto your child. It always breaks my heart to read through the comments section on posts on this topic and hear story after story of women who had a grandma or uncle or father or aunt or sibling that would make fun of their weight or make comments to them about their weight. Many of them are still struggling with self-esteem issues as a result of these comments and several ended up with an eating disorder in response to the comments. Don’t let all your efforts to help your child a positive body image be sabotaged by a tactless relative or friend. And if they won’t honor your request, limit your time with them. Point out the lies the media is trying to shove down your child’s throat. Have regular conversations about what they are seeing. Talk about what it really is and what it really means. There are a few awesome celebrities who have posted pictures of themselves without their hair and make-up done to help young girls understand they are being lied to. Show them these women and help them see behind the curtain of the media. I love Colbie Callait for making this video. 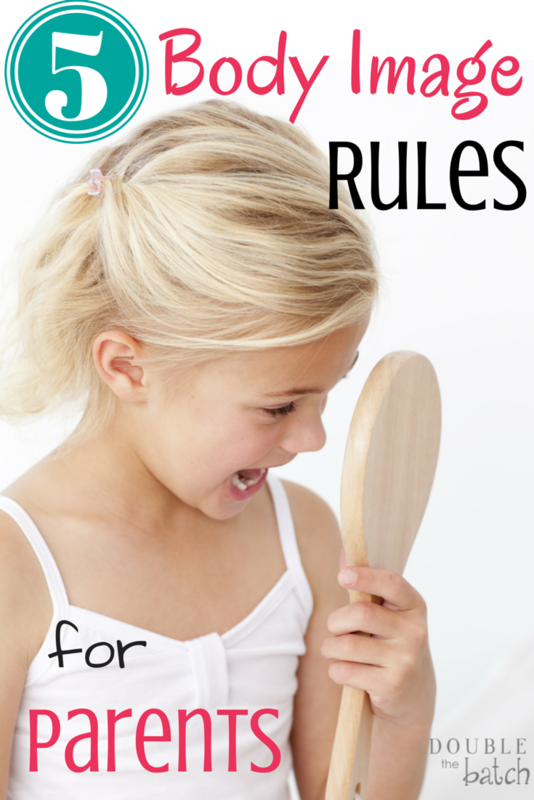 Rule #5– Teach Your Children the Truth About Their Bodies and Their Value. Teach them that the body they have been given is an amazing gift and a beautiful part of God’s creations. Teach them that it is a home for their spirit that they should treat with respect so that it can help them accomplish great things. Teach them that any limitations their body might have are just opportunities for themselves and others to learn important lessons in love and compassion and that as they choose to rise above their limitations they will inspire others in ways they never could if they had been given a body without them. Use real life examples to help your children understand what true beauty is. Look for and point out the kind of people I call “the men and women with the sparkly eyes.” They are people who you can tell have faced real challenges in their lives, but have chosen to turn to God and be made stronger for them. Because of what they have seen and experienced and the way they chose to work through their trials, they are filled with love and compassion for everyone around them and they love and lift everyone they come in contact with. They even leave the clerk at the grocery store a little better than they found them. These are the most beautiful people on this planet and you will never see their faces on a magazine cover, but if you are blessed to have these kind of people in your life, you know what true beauty is. And you know that it has nothing to do with weight and appearance and everything to do with the way you feel in their presence– loved, accepted, and lifted. That is the beauty I want to aspire to and that I want to teach my children to aspire to. And I want us to be so busy working on making our eyes sparkly that we don’t even notice the lies all around us anymore.